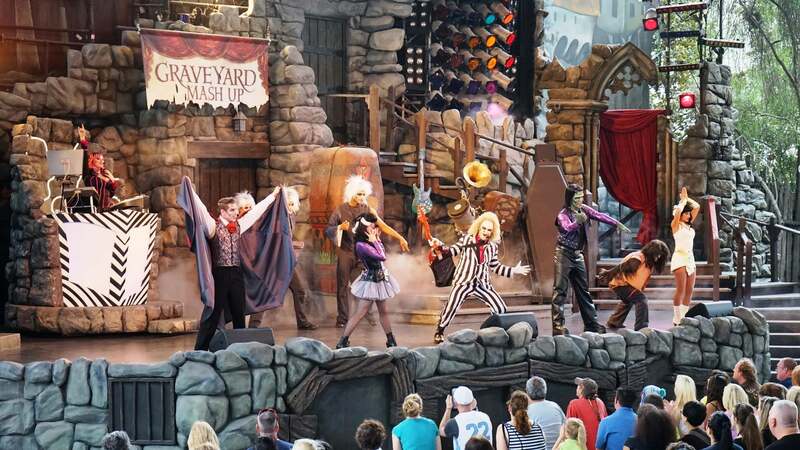 Universal Studios Florida’s classic monster rock-‘n-roll show got a reboot in early 2014, and the new “Graveyard Mash-Up” now features an almost constant stream of classic pop and rock songs – and more dancers – making it feel like a 25-minute mega dance video (whereas the old show featured a storyline, of sorts, and a fair amount of interaction between the characters and the audience). Whether or not you welcome the change, there is still plenty of energy, on-stage talent, and rockin’ good times to make this a “must see” at least once. The first show is usually around noon, and they occur every one-and-a-half to two hours from there. Try to get to the theater a little early for good seats. 12:30 pm, 1:45 pm, 3:45 pm, 5:00 pm. Fast & Furious: Supercharged will replace both Beetlejuice’s Graveyard Revue and Disaster sometime in early 2018.